Adult acute myeloid leukemia (AML) is a type of cancer in which the bone marrow makes abnormal myeloblasts (a type of white blood cell), red blood cells, or platelets. AML is a heterogeneous disease caused by a variety of alterations in transcription factors, epigenetic regulators and signaling molecules. Through an integrated analysis of purified leukemic blast cells, scientists have analyzed transcriptional networks in dozens of AML cases, along with the cis-regulatory element alterations coinciding with them. The findings highlighted ties between transcriptomic and epigenomic features that correspond to specific transcription factor, signaling molecule, or nuclear protein gene mutations in AML. 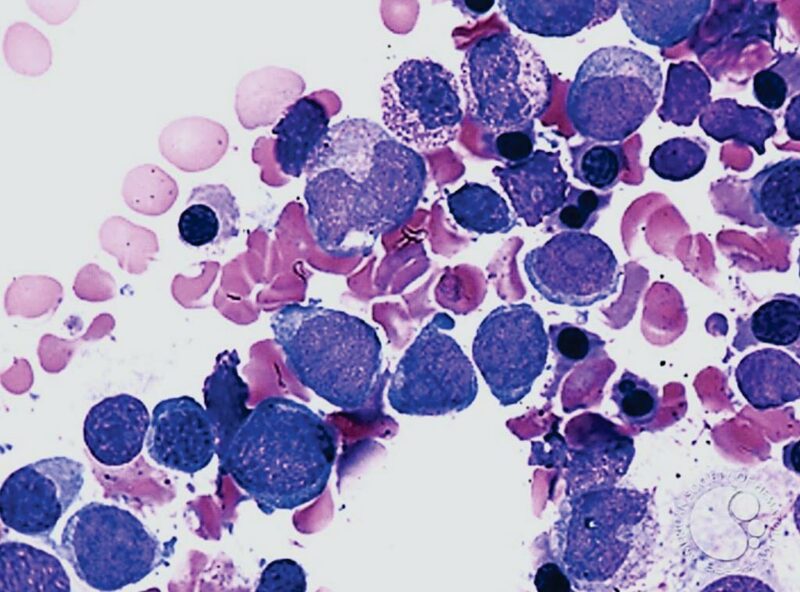 Image: A bone marrow smear of a patient with Acute Myeloid Leukemia; dysplastic changes are noted in both the granulocytic and erythroid lineages (Photo courtesy of Peter Maslak). A team of scientists at the University of Birmingham (Birmingham, UK) and their colleagues determined how different mutant regulators establish AML subtype–specific transcriptional networks, and performed a comprehensive global analysis of cis-regulatory element activity and interaction, transcription factor occupancy and gene expression patterns in purified leukemic blast cells. The team focused on specific subgroups of subjects carrying mutations in genes encoding transcription factors: Runt-related transcription factor 1 (RUNX1), and CCAAT-enhancer binding protein alpha (CEBPα); signaling molecules: fms-like tyrosine kinase 3- Internal Tandem Duplication (FLT3-ITD), and RAS, and the nuclear protein nucleophosmin (NPM1). Integrated analysis of these data demonstrates that each mutant regulator establishes a specific transcriptional and signaling network unrelated to that seen in normal cells, sustaining the expression of unique sets of genes required for AML growth and maintenance. The team performed transcriptomic analyses, chromatin conformation capture profiling, and digital footprinting in leukemic blast cells from AML cases with specific transcription factor or signaling gene mutations identified with targeted sequencing on 55 cancer-related genes. In particular, the team incorporated RNA sequence data and open chromatin-mapping DNase I sequence from 29 purified leukemic blast samples from bone marrow or peripheral blood samples in AML cases involving a series of distinct mutations, including several distinct RUNX1 alterations. Along with promoter cis-regulatory element interaction profiles and data for a dozen samples assessed with at least one genomic approach, the data revealed transcriptome, chromatin, transcription factor occupancy, and regulatory clusters that coincided with specific AML mutation subsets. Constanze Bonifer, PhD, a professor and co-senior author of the study, said, “Crucially, AML cells from patients with the same types of mutations always take the same route when they head off in the wrong direction. Our analyses of each of the pathways that the cells took when developing into cancer identified key points in the cell that could be used in the future to target and develop new drugs to treat each type of AML in a different way.” The study was published on November 12, 2018, in the journal Nature Genetics.